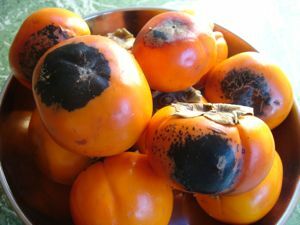 Blackened organic persimmons for 75 cents a pound vs. around $3 a pound? Sign me up because I’m making persimmon butter. Bought these from Kaki at the Berkeley Farmers’ Market. They told me the alarming-looking sooty skin wouldn’t affect the fruit and they were right. 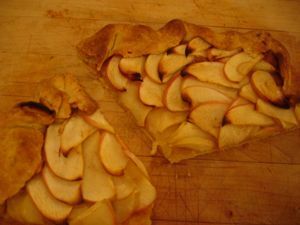 This and the galette I’m using it for are the last two recipes for the book. I really wanted both recipes in the book so I’m thankful that Chronicle let me go past deadline until the persimmons came into season. I wavered between using Hachiyas or Fuyus. Fuyus are more readily available and I figured they would behave like apples when turned into butter. Whereas the Hachiyas are lovely to bake into puddings and cakes as long as they are gooey ripe, they can be very tannic when cooked on the stove. I’ve heard that if you freeze them first, that takes care of the problem. I was also going for an interesting flavor profile so I settled on cinnamon, cardamom, rum, vanilla beans, and lime. Wow. It’s really good. Visions of holiday gifts are now dancing in my head. 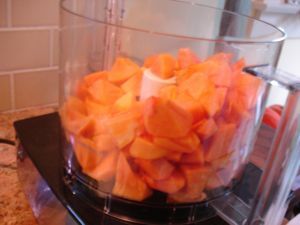 Peel and cut the fruit into chunks and put it in the food processor. I used about 2 1/2 pounds of persimmons. Process until smooth and then put it through a potato ricer or food mill if you have one. If you don’t, it won’t make that much difference. Put the pulp in a heavy enameled cast iron pot and add 2/3 cup sugar, 2 tablespoons maple syrup, a whole cinnamon stick, a whole vanilla bean, split and scraped, and the crushed seeds from one cardamom pod. Cook it down over low heat for at least an hour until it darkens and thickens, stirring occasionally and watching carefully so it doesn’t stick and burn. Add two tablespoons of white rum and continue to cook for 10 minutes. Add the zest of one lime grated on a microplane. Stir and taste. Cool and refrigerate. 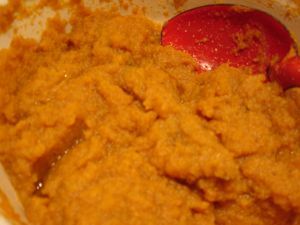 I used about 2 1/2 pounds of persimmons and it yielded about 2 cups of persimmon butter. For the galette, I used about 3/4 of a cup of persimmon butter. I simply spread it on thinly leaving a border and then laid the apples out on top. The dough for the galette was my usual dough from this recipe but instead of all butter, I used 4 tablespoons leaf lard bought from Prather and 3 tablespoons butter. That turned out to be a very good decision. I brushed the apples and crust with a little butter halfway through baking. This was served in the Headlands kitchen to Eduardo, his baking assistant Megan, and a few people who wandered in. It was a hit. The rest of the butter is being eaten on toast. Yesterday, I spread a little on a piece of whole wheat toast and added thin slices of gruyere. What a sublime afternoon snack! This entry was posted in DIY, dessert, entertaining, from the market, fruit, holidays, pantry staples. Bookmark the permalink. Post a comment or leave a trackback: Trackback URL. P.S. Still have some to harvest if you are up Davis way. Yay! So glad you tried the recipe. I’m glad you liked it. Have a great holiday you guys! 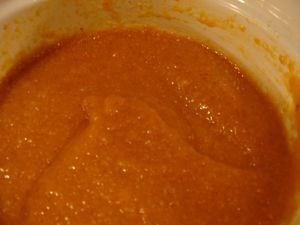 After reading your post I may need to take another shot at persimmon butter. My first attempt failed miserably. Luckily, all was not lost because the mixture made a wonderful ingredient for persimmon cookies. This looks great! I’m going to try and adapt this for the 10 pounds of so Hachiyas I have in my kitchen.